South Leicester moved up to third from bottom with a surprise victory at Otley last Saturday, but it was not enough to save their bacon after a campaign which has seen them win just seven times. South Leicester went down 25-0 at Lightfoot Green in December. Hoppers’ hard-fought defeat of Stourbridge last weekend – combined with a four-point deduction for Otley for a breach of the regulations – means Paul Arnold’s men are now seventh on 84 points after 15 wins and 13 defeats. As an incentive to win their last two games, he is challenging them to top 90 points. He rings the changes again tomorrow, with James Gough having had an operation on his ruptured Achilles, Pete Altham and James Fitzpatrick working and Sam Stott skippering Lancashire Under-20s in the County Plate semi-final against Hertfordshire this weekend. Nathan Pope and Scott Jordan return at full-back and scrum-half, with Will Davidson and Tyler Spence switching to the threequarters. Forwards Adam Howard and Paul Millea take a turn on the bench, as Noah Miller and Ryan Purcell start in the front row and Ollie Trippier at flanker, with Ally Murray moving up to lock. 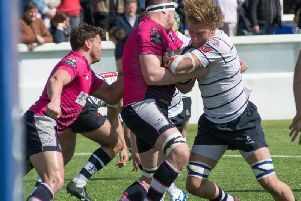 Fylde host Sedgley Park in a clash of the fourth and fifth-placed sides, with the play-off spot now virtually beyond both clubs’ reach. Hoppers and Fylde have Easter off before the final round of games on April 27 but Vale of Lune‘s season ends tomorrow. They bid farewell to the North Premier League with a daunting visit from Blaydon, who got Vale’s season off to a grim start with a 92-12 hammering in the North East in September. Vale make one change in the back division – Charlie Lomas stands in for Billy Swarbrick at scrum-half – and will choose their starting pack from six of last week’s line-up, plus Adam Foxcroft, James Robinson, Sam Wallbank and Luke Ford. Hoppers: Pope; Trueman, Hurst, W Davidson, Spence; T Davidson, Jordan; Madden, Miller, Purcell, Procter, Murray, Carlson, Trippier, Lamprey. Replacements: Howard, Millea, Holden, Jobson, Crow. Vale (from): Ramwell; Robertson, Hall, Owens, Fern; Briggs, Lomas; Stevens, Powers, Pillow, Foxcroft, Robinson, Vause, Holdbrook, Wallbank, Ayrton, Ford.